It has been four months since the last post---way too long. So, there is much to catch up on. Since one of the most talked about subjects by farmers is the weather, I'll start there. The winter that didn't want to come morphed into the winter that didn't want to leave. January and February were unusually mild. This got our hopes up about an early spring and an early garden planting. So we timed our seedlings accordingly. Unfortunately, March and April were unusually cold, which dashed our hopes about an early planting (except inside the rolling greenhouse, where we can control the climate). We heard from a friend that this was only the second time in the last hundred years that March was colder than February in this area. An extra-heavy snow in mid-April took a long time to melt, and consequently we were later than we hoped in getting our cool weather spring crops in the ground. Eventually the direct seeds and the transplants were all in. But then yesterday, Mother's Day, we had an overnight snow---3" of heavy snow---which was not at all forecast. The overnight low was forecast to be 39F, so I decided to run heat in the rolling greenhouse where we have tomatoes, peppers, eggplant, etc. That was fortunate, because we got up at 5 a.m. yesterday morning to all the snow and an outside temperature of 28F. The heavy snow was bending many young trees over to the ground, and quite a few broke. We had hoops with row cover fabric on most of the garden, but the snow had collapsed it all right down to the ground. We had more blossoms in the fruit tree orchard than ever before, and all the flowers were weighed down with snow. It rained all day, and almost all the snow was gone by nightfall. Today, the row covers had all popped back up, and the fruit tree flowers are all still intact. We have our fingers crossed that there won't be too much damage. We had friends visiting us on Saturday, before the overnight snowfall; I emailed them pictures of the snow; and I was informed about "poor man's fertilizer," which I'd never heard of before. Snowflakes, as they form and fall, absorb nitrogen from the atmosphere and then release these nutrients into the soil as the snow melts. Who knew? Always a silver lining. Peach blossoms with snow on Mother's Day. Downed trees by new greenhouse, again, on Mother's Day. Big snowfall in mid-April delayed spring garden. Spring crops finally planted, protected by row cover, before Mother's Day snowfall. The last time I wrote, I told about about the hose trolley in the new seedling greenhouse. We've since added a second one in parallel, to facilitate watering the entire greenhouse. This spring the entire floor was covered with seedling flats and transplants in 4" pots. We also have about 60 fifteen-gallon fabric "grow bags", for ginger, turmeric, banana trees and fig trees. Two years ago we planted a half-pound of ginger root in the citrus/avocado tree greenhouse as an experiment. It did so well that last year we increased to 3 pounds planted. This year we planted 25 pounds---a half-pound each in 50 grow bags. Today, I saw the first sprout. The seedlings we've grown this year have been much more vigorous than the past few years, I suspect from more light and more even temps in the new greenhouse. The upstairs seedling bench in the citrus greenhouse where we had been growing seedlings really overheats on bright, sunny days, stressing the seedlings. And when we ran out of room up there and moved flats and pots down between the trees to make room for more, they were in shade a lot of the time. The new greenhouse has already proven its worth. Something new for us this year is we tried grafting tomatoes. We had a high success rate for the grafts, and preliminary results for the plants look great. The purpose for grafting tomatoes is much the same as with fruit trees. By grafting a favorite variety onto a more vigorous rootstock, the plant ends up growing much larger, healthier, and producing a lot more fruit. This winter was our second with a winter garden in the unheated rolling greenhouse. Two years ago we tried a variety of vegetables that Eliot Coleman has found to be winter hardy---spinach, carrots, mache, minutina, etc. The spinach did so much better than anything else, we decided to just grow that this winter. "Winter-kissed" spinach is a like a completely different green than regular spinach. The freezing temps causes it to metabolize more sugars, making it very sweet, mild, and tasty. We like it, and our customers do too. We intend to keep growing it every winter. We only got a crop from half the greenhouse this year however, because we planted half the greenhouse in August and half in September, to try to dial in the best planting date. The experiment worked, but the early planting bolted before cool weather and didn't last into winter. The later crop worked out superbly, and we got four or five cuttings throughout the winter. We had a nice citrus harvest again this year---navel oranges, Minneola tangelos, blood oranges, grapefruit, and many Meyer lemons. We harvested over 500 lemons from two small trees, and we still have a few more to pick. We were disappointed by the lack of pollination of our avocados in March, however. Last summer I screened all the vents in the greenhouse, so the bees wouldn't escape on sunny days, like last year. We ordered a lot of mason bees this year, but we had a poor hatch rate for some reason. I only saw one or two bees emerge, and haven't seen any fruit-set. This was the third year in a row with lots and lots of avocado flowers but no fruit-set. So, we'll regroup and try again next year. As I've mentioned before, we follow Baretta's motto: "We're gonna do this 'til we get it right." Some of our Meyer lemons. The heating system in the new greenhouse worked excellently this winter. Our plan was to keep the temperature at a minimum of 40F, which would be more than adequate for the baby greens we eventually want to grow in beds during winter. I'd set the thermostat to open the zone valve, and start pumping hot water through the PEX in the slab, at an air temp of 60F or a slab temp of 45F. On nights that got into single-digit temps or lower, the greenhouse temp fell into the high 30's. So I raised the the cut-on temps to 70F for the air temp and 50F for the slab. Afterward, the lowest overnight temp in the greenhouse was 40F. Also, on sunny days, even when it was bitterly cold outside, we frequently saw the greenhouse warm up enough to activate the in-line fans which blow hot ceiling air down through the earth tubes. By the time we got the greenhouse heating system running in December, the underground temp was at 52F. With the earth tube heat, it never dropped any lower all winter. The underground heat is now up to 57F. Our hope is to be able to superheat the ground this summer, and reduce the heating requirement by the hot water through the slab. Our garlic has been so successful at market that we doubled the size of our crop this year, from 1800 head to 3600 head. The've "popped" and are looking great. Garlic "popped". This photo was taken before Mother's Day. Last year at this time we were already into a drought and irrigating regularly. This year we've had steady rain, and it looks like we may not need to irrigate the outdoor crops for a while. Just another example of our wildly fluctuating weather. Row covers protect less hardy crops against older temps. It also protects crops from insects, like brassicas from cabbage butterflies. Regular readers may have noticed that we posted a page on our website in January announcing a "Special Opportunity" for a young couple to partner with us here at SCSA. 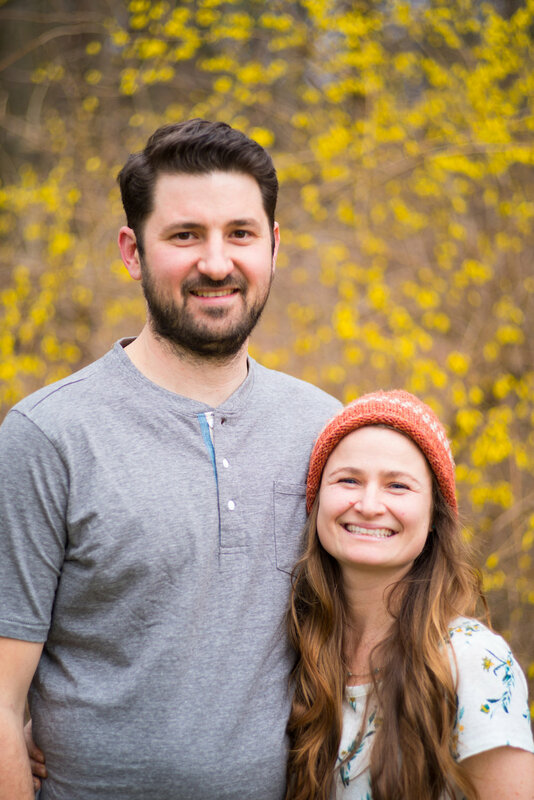 We are very excited to announce that we have found a highly qualified couple that have recently joined us---Micah Witri and Laurel Schultheis. They share our values with regard to agriculture, the environment, and sustainability, and we very much look forward to our new arrangement with them.